When White2Tea first shared a teaser image of the mao cha they were using for an upcoming sheng cake, I was quite confused by the apparent nei fei in the image. The nei fei (a small inner label pressed into a puerh cake) had a reddish blob that appeared to be a pair of lips. But knowing that this is White2Tea, which never fails to amaze me with their unique style and creativity, I decided that this was probably not an optical illusion, and it was best to just accepted the high probability that I actually was seeing a mouth and hope the meaning of that would be clear later on. I later learned that this new cake is named Pin, and the outer wrapper has not one but three colored blobs that are, without a doubt now, mouths. I'm sure anyone with a good understanding of Chinese probably got a chuckle out of this, but the rest of us need some explanation from TwoDog. According to TwoDog, the Chinese word for "mouth" is "kou" and represented by the chinese radical 口. If you have three of these radicals in a triangle configuration, you get 品, the word "pin." The word "pin" is Chinese for "to savor" and he further explains that it could be applied to a drink, such as tea, to mean, "drinking with intent." Further he explains that the phrase "pin cha" (品茶) "literally means 'to taste tea.'" This wrapper has even deeper meaning than that though. The triangle theme is also represented in the red/pink background which is actually a triangle when the wrapper is unfolded. 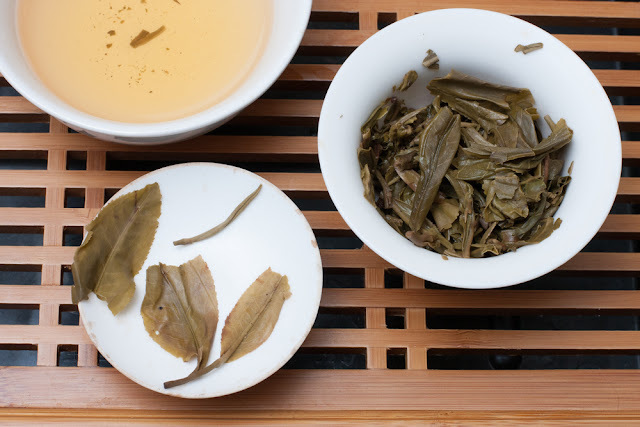 The three mouths or three points/sides/angles of the triangle represent the tea material used to make Pin, which is a blend of Lincang material from 2013, 2014, and 2015. Aww, the nei fei got flipped over during pressing. Blended Lincang material from 2013, 2014, and 2015. The 200g cake as a whole shows a beautiful mosaic of colors. This is partially due to the fuzzy white buds mixed with the fuller leaves, but is also likely a result of the blended material of different ages. The older material was stored by TwoDog in Menghai to mellow out a bit in contrast to the young 2015 material. The compression is a good "medium" -- not so loose that it can be pulled apart by hand, but loose enough that a tea pick can separate it without doing too much damage. I wasn't entirely sure the best way to brew this tea and I'm still experimenting, but so far I have been using water around 200 degrees F which I sometimes use for younger raw puerh. Of course this one also has components from 2014 and 2013, so going with water right off a boil might not be too risky. I have stuck with my usual 5g per 80ml gaiwan for now and started my first few infusions around three to five seconds or so. 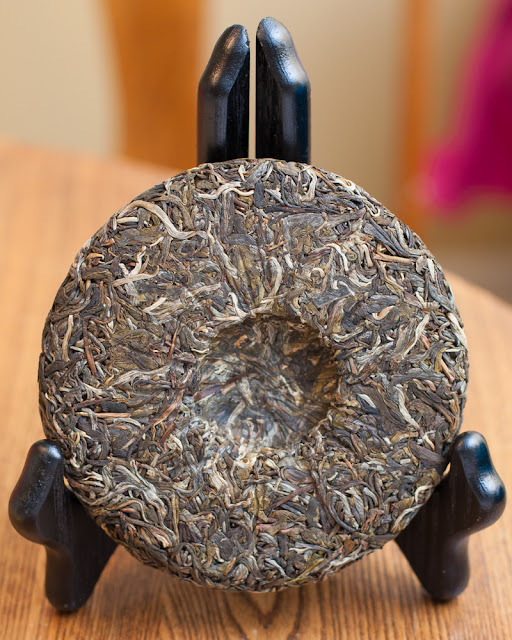 Maybe it’s because I just got over a mild cold and can breathe better today than any day this past week, but the wet leaf aroma of this tea is very strong, and although it does have a “young raw puerh” aroma, it seems much deeper than some, likely due to the older material also used. Imagine autumn leaves coated in dark honey-- that may sound strange, but an aroma like that in a tea is amazing. The honey colored clear liquor is very viscous and has a thick mouthfeel-- it is one of those teas that you almost feel the need to chew while drinking it. The sides of the tongue feel some mild astringency at first, and then a couple minutes later the entire mouth feels a subtle tingly sensation. 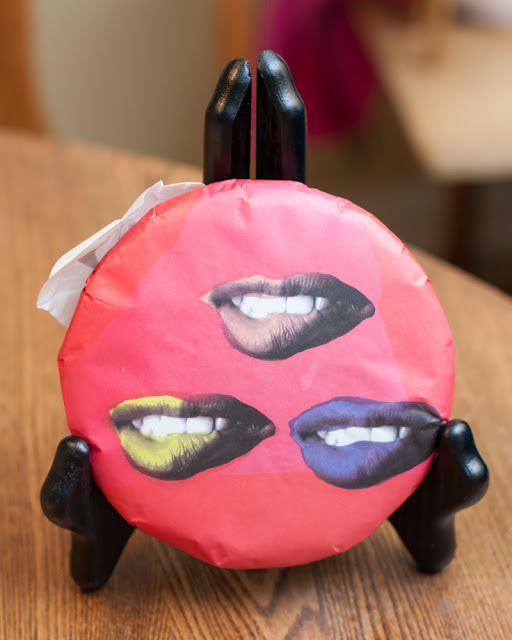 It's suiting that a tea with three mouths on the wrapper would have such an active mouthfeel. The overall taste of Pin is very well balanced. 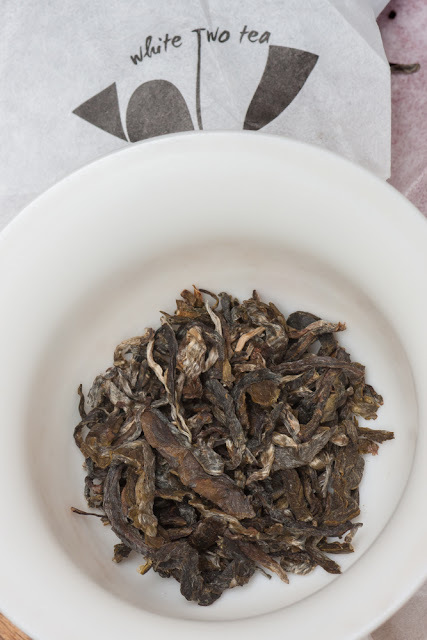 It has a general herb-like flavor similar to oregano accompanied by grassy and hay notes, and early on it also has a hint of clean smoke which seems to fade in the middle and late infusions. After the first three or so infusions the flavors become even more balanced and stay very consistent with each subsequent infusion. 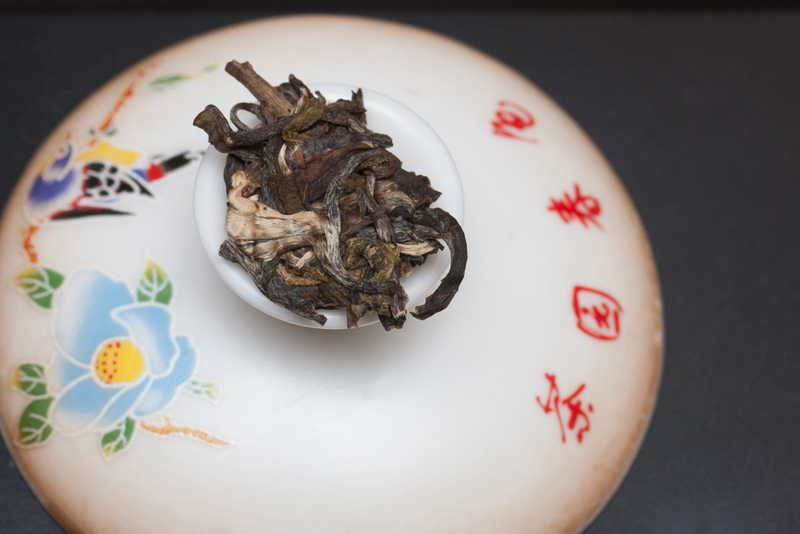 These middle infusions bring out a pleasant sweetness that contrasts well with the young sheng bitter bite. This is again one of those teas where I lost count of how many infusions I got out of it, but my 1.7L electric kettle was giving me a "Low H2O" warning before I was finished. Well balanced flavors and many consistent infusions seems to be a great indicator of high quality material. Beautiful deep olive green leaf color. I broke this selection from a tighter part of the cake but was still able to leave many leaves mostly intact. Beyond the taste is a wonderful aftertaste which further indicates the high quality of material used to make Pin. The aftertaste first retains the hint of smoke and herbal characteristics found earlier, but then blossoms into a nice tea perfume hui gan that lingers in the mouth for several minutes. 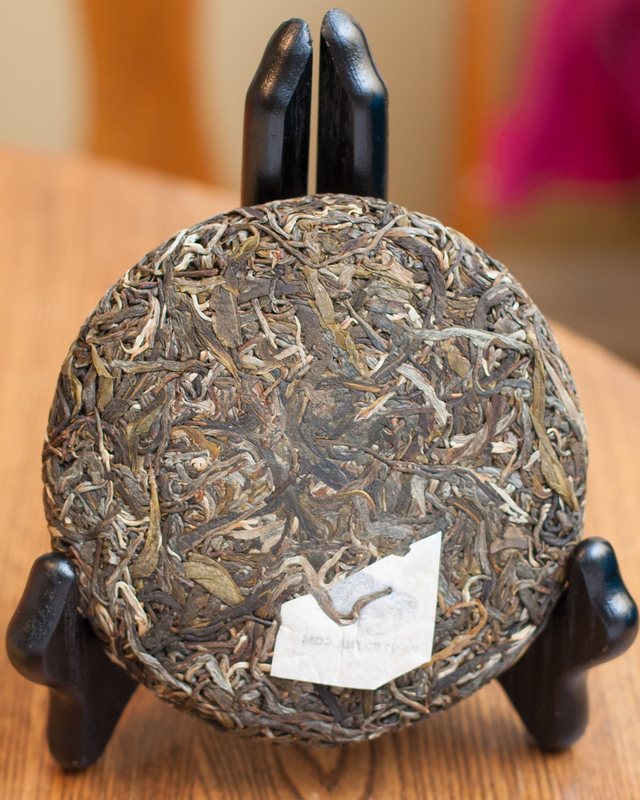 I should also mention that the cha qi from this tea was quite noticeable when I drank it. This is certainly a great tea to drink with intent and savor, and I'm very curious to see how this one will taste many years down the road. This is something interesting. I am sure that dissertation service and tea lovers are going to love this for sure. Thank you for sharing this with us.